The range gel pack consists of three types of item. The shared technical characteristics are as follows: Outer shell made of natural high density polyethylene, providing rigidity and total seal integrity. 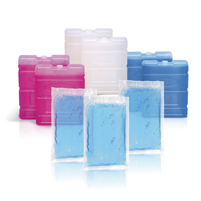 These gel packs can be stored in freezers at very low temperatures (-80 °C). The formulation of the gel is exclusive to SOFRIGAM, guaranteed non-toxic, with a high capacity to generate cold (+20°% / water). It is easy to use these gel packs: to begin with the gel must be frozen to a temperature at least 5 °C lower than its eutectic (solidification) point. 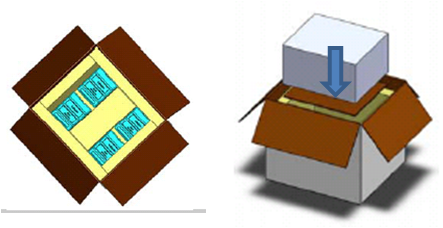 When placed inside an insulated packaging, it will then maintain the heat sensitive product within the required temperature range, for a certain time depending on the number of gel packs placed in the packaging. The principal users of the gel pack product range are pharmaceutical companies, specialist hauliers, the food processing industry and biological and medical analysis laboratories. This top-quality professional product is also available to private individuals for carrying food during picnics, buying frozen food products, etc.